I clearly have a thing for bolognese. I’ve made it with tempeh, with mushrooms with red lentils and now with eggplant. And really, it might be the most perfect comfort food. Simmered all day on the stove and served over pasta (or polenta), it’s always a crowd favorite. When I was in Italy last fall, I tried to eat bolognese as much as I could. Which thankfully, wasn’t very hard. A bowl of homemade pasta with bolognese sauce and a carafe of house red wine would take care of my mom and I for hours. During our trip we got the opportunity to spend a day cooking in Tuscan villa. I tried my hardest to channel my inner Diane Lane and went crazy learning to craft wood-fired pizza, bruschetta and of course, homemade pasta with bolognese sauce. In this version, our chef used an entire bottle of red wine in the sauce. A whole bottle! While I have no problem throwing a glug or two in my sauces, I was surprised by how much this ingredient changed the bolognese game. To this day, that meal may top the best-thing-I’ve-ever-ate list. Don’t worry. I’m not calling for an entire bottle in this recipe, though I am asking you to throw in 2 cups worth. You can save the rest for dinner or to enjoy while cooking. This works when you’ve got the time to simmer the sauce down, allowing the alcohol to cook off and the body of the wine to remain. The other trick? We are roasting the eggplant first. You want the flesh to be almost caramelized, scooping out the tender eggplant from the charred skin to melt into the sauce. If you can’t mash the eggplant with the back of a spoon, it’s not tender enough. I was going to stop here. And, to be frank, you could stop here. The eggplant alone provides such a nice body to the bolognese that you almost don’t need anything else. But, I’ve been on a mission to eat more lentils as of late. For me, for BL and for the baby. While I don’t normally stress about my protein intake, I’ve noticed that days will go by when I really don’t eat anything of hearty substance. Yes, I’m getting protein from my grains and vegetables, but I was craving something more meaty and hearty this day. So, into the pot lentils went. Lentils (and other legumes) are one of the few plant-based sources of the essential amino acid lysine. You can get all of your lysine needs by eating two-three servings per day of legumes, roughly 1/2 cup of beans, lentils or a soy-based product. Therefore, I’ve made it my personal mission to incorporate at least 1/2 cup of lentils/beans into my diet every day. I usually do this pretty well without thinking, but I want to make more of a conscious effort to do so- especially being so pregnant. Plus, all the fiber is so good for the gut. 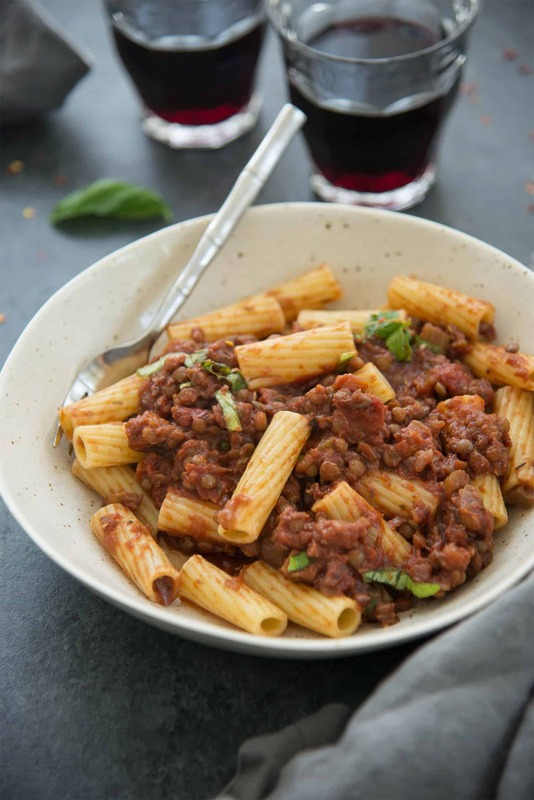 Serve this one with a thick noodle, like rigatoni, so the sauce can cling to the ridges and hide inside the pockets. It also tastes amazing with a big bowl of creamy polenta, the perfect ‘welcome home’ meal to Fall. 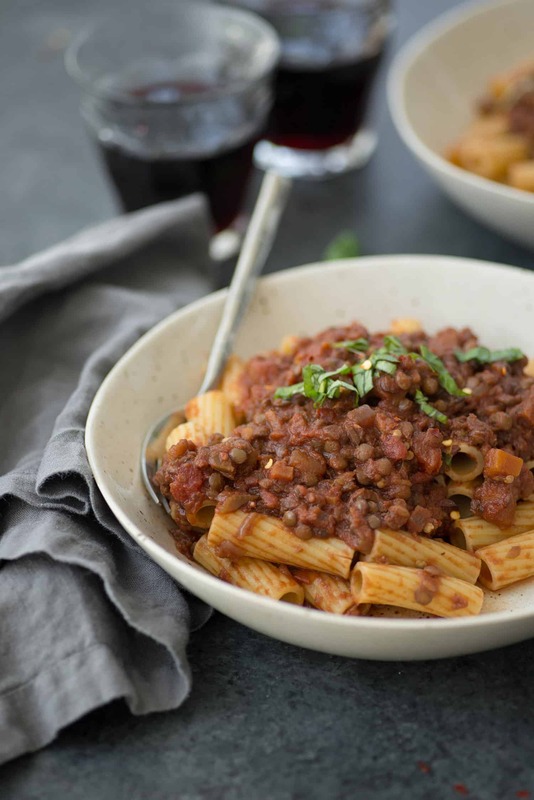 Eggplant Lentil Bolognese! 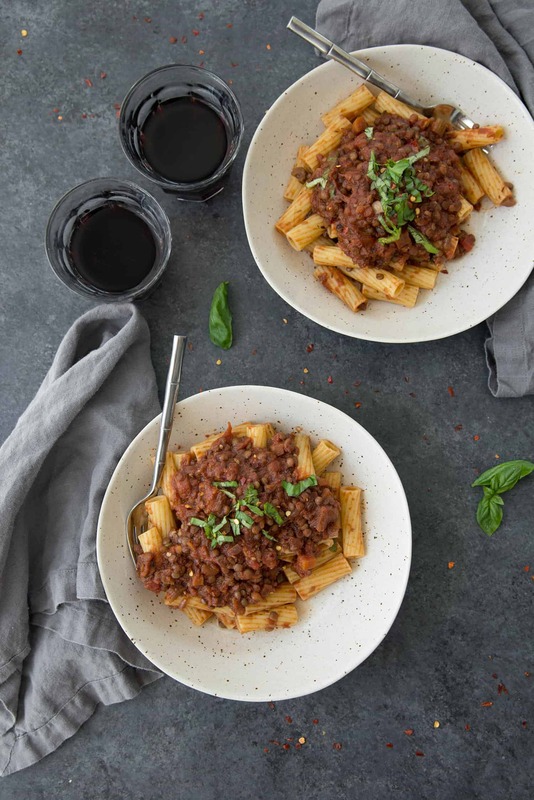 You’ve gotta try this vegan and gluten-free pasta sauce, so hearty and full of plant-based protein. 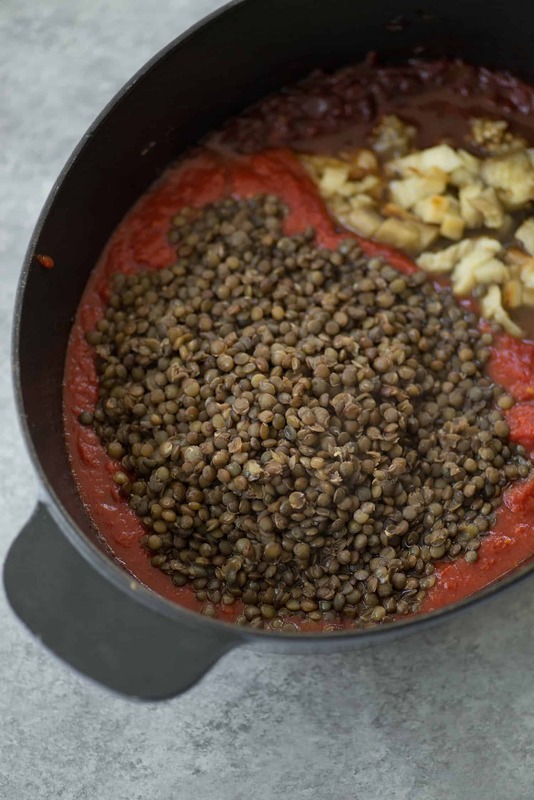 Roasted eggplant, homemade sauce and lentils. Preheat the oven to 350 degrees F. Rub the eggplant with some of the olive oil and place on a baking sheet. Roast until very tender, about 1-1 1/2 hours. The skin should easily peel off and the insides creamy. When the eggplant is 20-30 minutes to being done, heat the remaining olive oil in a large dutch oven or stockpot over medium heat. Add the onion, celery, carrots and salt. Cook until vegetables are very soft, about 15 minutes. Add in garlic, oregano and thyme. Add the wine and cook until wine is reduced by at least half and sauce has thickened. Stir occasionally to prevent sticking. Add in the tomato paste and cook again until thickened. Peel the eggplant flesh and scoop out the flesh. Roughly chop, if needed, and add that to the pot along with the cooked lentils and tomatoes. Reduce heat to low and simmer until thickened and cooked together, about 1 hour. Season as needed adding in more salt if desired. Before serving, stir in basil and enjoy. This is the first recipe I saw when I pulled up your website and it made my mouth water. I’m planning on making it this weekend. My question to you is what would you recommend as a substitute for the red wine in this recipe? And for the others who don’t mind the wine in the dish, what type of Red Wine would you recommend? Hi Christine- glad you found the recipe! Honestly, I don’t know if it will taste quite the same without the wine since it adds so much flavor, but you’ll want to deglaze the veggies with something. I’d recommend a few splashes of red wine vinegar. You don’t need much, maybe 2 tablespoons or two? Then, scrape the bottom before adding the rest of the ingredients. I usually use a Chianti in my sauce recipes- it’s fairly affordable and provides yummy flavor but almost any dry red wine will work. Do you think the sauce is freezer friendly? Tried this yesterday and doubled the recipe to get value for the time I put in. I used a bit less wine (600ml for double recipe) and salt as I’m cooking for a baby too. I think I slightly reduced the wet tomato as I only had two cans and a box of passata. But I grated most of the carrots which I know gives extra moisture. This makes it easier for baby to chew. However the finely chopped carrots were soft by the end of cooking anyway and I couldn’t taste the wine at all which I usually do when I cook with mince meat. It was absolutely divine. Carnivorous husband approved and I’m glad I have another 3 meals worth in the freezer now. Thanks. Do I need to pre-soak/pre-cool the lentils? Never cooked with them before. Hi Kerin- you don’t need to soak them ahead of time. Hey Alex! When you say cooked lentils how should they be cooked? Thank you! 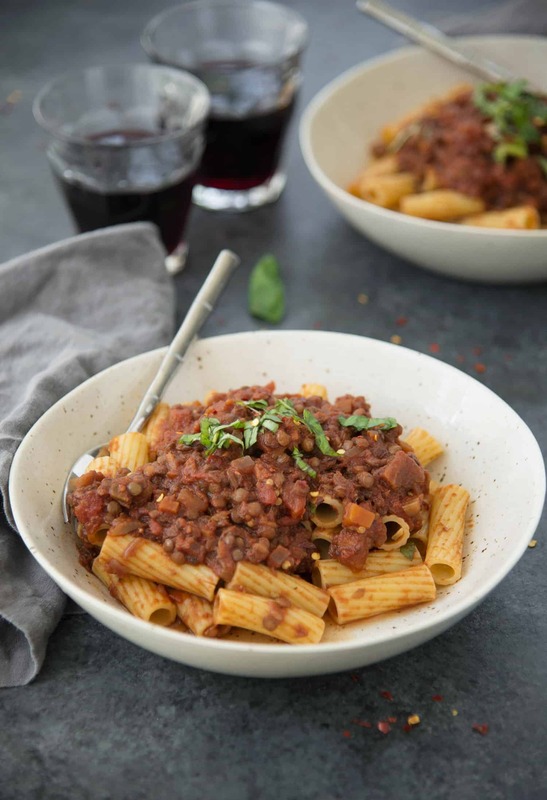 Hi Britt- lentils can either be bought canned (like beans, sometimes hard to find in regular grocery stores but Whole Foods sometimes carries them) or pre-cooked in the fridge section (like Trader Joe’s or grocery stores- they usually are salted, so you will need to cut back on salt in any recipe you use them in.) OR- rinse dry lentils first (sometimes they have dirt on them), then cover them with water and cook until tender. Most lentils will be done in 25-30 minutes. 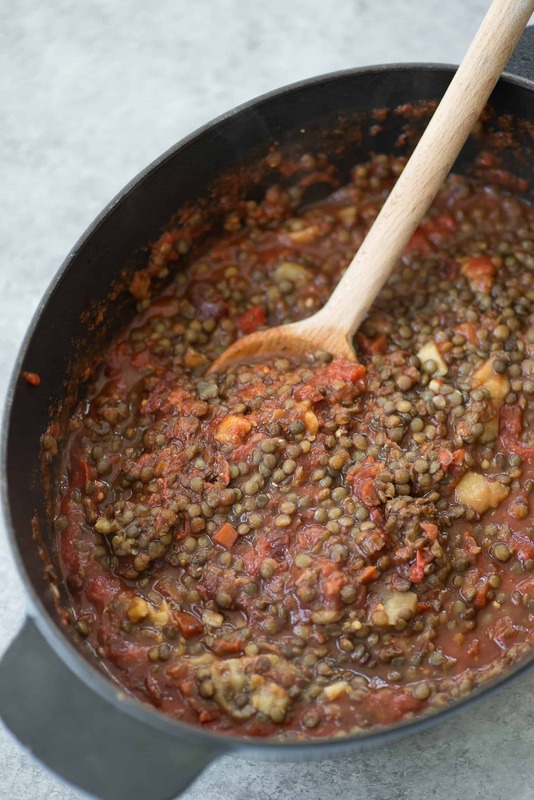 You’ll want to use either brown or green lentils for this recipe, yellow/red lentils will break down when cooking and not work in this sauce. Let me know if you need anything else! Hi Marie- serves 6. Thanks! This was excellent! We didn’t miss the meat at all. I was initially nervous about how much wine was required, but it was just right! Thank you! So glad you liked it! Thanks Molly! I made this yesterday and served today over brown rice. Really delicious, especially the next day. Used Trader Joe’s ready-to-eat steamed lentil beans and chinese eggplant. The lentil beans are perfect and do not get mushy. Thank so much for the recipe. Glad you liked it! Thanks Kali!